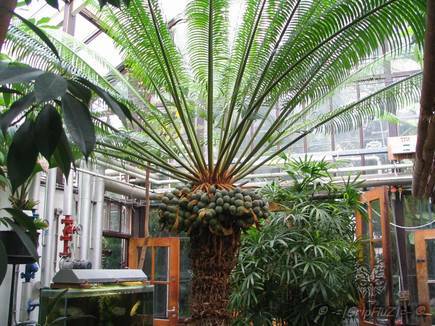 Synonyms: Cycas circinalis subsp. 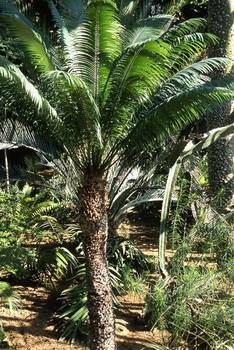 madagascariensis forma trigonocarpoides, Cycas comorensis, Cycas madagascariensis. Distribution: Open coastal forests of Madagascar, the Comores, the Seychelles, and the east coast of Africa. 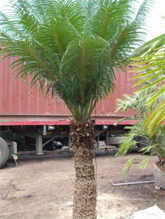 Description: A large cycad to 10 m tall, with a 450 mm diameter trunk, which produces offsets along its length. Numerous (to 40) long (to 3 m) shiny green leaves. 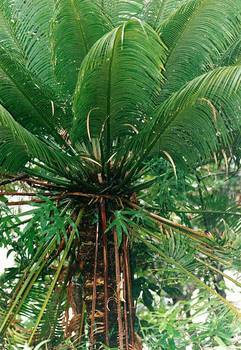 Very similar in appearance to Cycas rumphii C. rumphii . 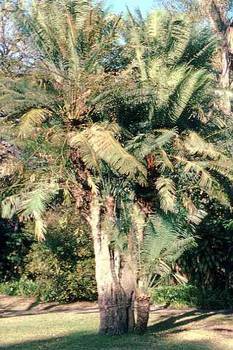 The species was regarded by de Laubenfels as including material from Sri Lanka now referred to Cycas zeylanica (J. Schust.) A. Lindstr. & K.D. Hill. In addition to specimen records examined, none of which is from a protected area, the species has been seen on Nosy Mangabe (Schatz, pers. obs.). 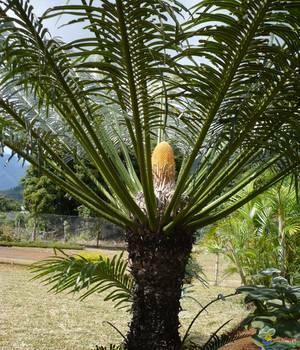 Historical notes: Madagascan cycads were first recorded under the name C. circinalis by Louis-Marie Aubert du Petit-Thouars in his review of the botany of French colonial possessions in the Indian Ocean in 1804. They were again discussed by Robert Brown in 1810 under the name C. thuarsii? (sic - with a query), with the observation that they scarcely differed from plants from India and Ceylon. He had apparently studied specimens at Kew that had been collected ?from Madagascar by du Petit-Thouars. Brown did not furnish a valid description, but it has been argued that his reference to du Petit-Thouars can be accepted as a basionym. C. thouarsii was again described in 1829 by French explorer and botanist C. Gaudichaud-Beaupre (1829), in his treatment of the botany in M.L. de Freycinet's account of voyage of the S.M. Uranie. He provided a minimal but valid description, and attributed the name to Robert Brown. No Type was cited. The name was attributed to Robert Brown ("Ex R. Brown"), and distribution cited was "In Insulâ Madagascar". However, Brown did not actually publish the name, but merely referred to collections by du Petit-Thouars from Madagascar and seen at K (du Petit-Thouars collections are mainly at P and PC, with some at K and BM). These collections would constitute the type. Cycas thouarsii female plant, with several immature seeds. 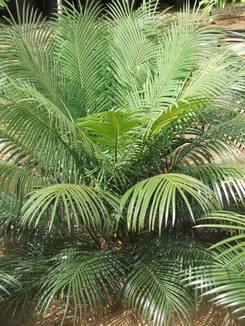 The Cycad Thouarsii is one of the most impressive cycads around; easily grown and amply rewarding to the garden owner. Both the Circinalis and Thouarsii are commonly confused, as there are almost no differences between them. Actually, it will be more correct to assume that we are growing the latter. Good for any garden, private or public; it will take the center stage maintaining dark grey green leaves ranging up to 2 meters long. 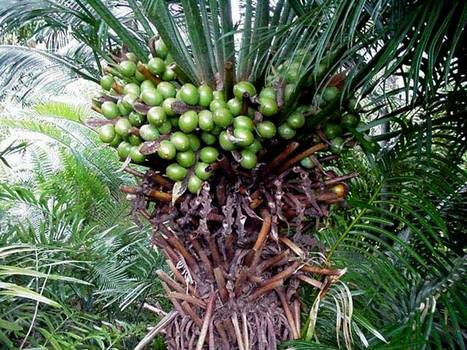 The plant can reach an impressive height of 10 meters and the female has a large red seed cone. It is cold hardy; likes light shade though will live in full sun. It will not respond well to overly dry conditions. Thanks for your beautiful picture Roberto.